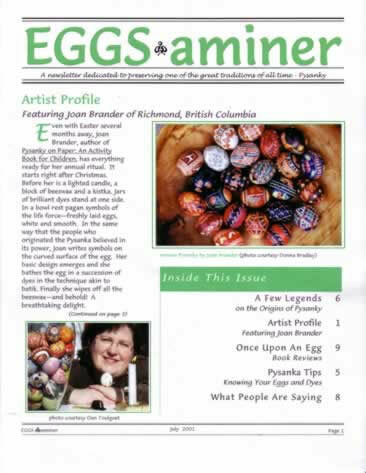 In its heyday in the last millennium, EGGS-aminer was the first of-its-kind print newsletter dedicated to pysanky. Today its bits and bytes blast into your fast-paced world in digital format a much lower production cost for us and a much reduced retail price for you! Publication began in 1995 and continued to July 2001. EGGS-aminer Newsletter continues to be a valuable resource to readers of all interest levels. To complete your collection, you can still order back issues in digital form. 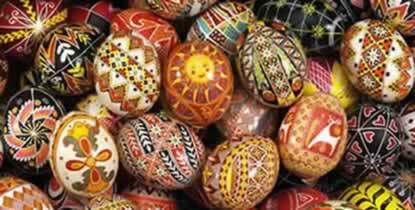 EGGS-aminer is a newsletter dedicated to promoting greater public awareness of Ukrainian Egg Decorating (Pysanky).